“The Unicorns arrived right after the buses. ‘Pip!’ My father said as my elbow accidentally knocked a box of rocks onto the ground. As Pip’s antics get her into trouble her summer starts with murmers about ‘the Unicorn incident’ and her parents want to ship her away. So off she goes to her Aunt Emma’s Clinic for Magical Creatures to spend the summer working and learning how to behave around magical animals. But Pip doesn’t really need to learn anything about her own behaviour, because she can speak to the animals and learn more about them than any adult could. And when some of the animals start bursting into flame around Cloverton, its up to Pip and her new found friend Tomas to figure out whats wrong before its too late! I knew I would love this book before I started reading it as its written by two authors I believe are exceptionally talented and have adored before. As its aimed a little younger than the two usually write for I was a little bit worried, however I think they’ve pulled it off perfectly and produced a fun, humorous and exciting book for all in that age range, and above! The book is focused around Pip, a 9 year old girl who loves magical creatures and everything about them. She’s a bit of an oddball and you can tell she likes to spend a lot of time on her own, preferring the company of animals to people. She has a special ability in that she can talk to magical creatures and that sometimes gets her into trouble because people don’t believe her. I loved the light hearted nature of the book and Pip’s attitude towards everything, its very can-do and even though she should probably think twice about some things, she is a very determined girl. I loved Tomas too and his string of allergies and the way that Pip seems to rub off on him a little but throughout the book. The writing style is great and honestly its not obvious that two authors co-wrote it. There aren’t alternating chapters like some co-authors like to do and nowhere does the style change. Its obvious that the two wrote the book in conjunction with each other, not just passing it back and forth but talking about how they wanted the character of Pip to come across and where the story would go. It was written as a guide that Pip would like to read and I loved that. She keeps referring to Jeffery Higgleston’s Guide to Magical Creatures and I believe thats like a textbook more than a field book but this book is written as if its a field book from Pip herself. It includes drawings of the creatures mentioned with notes about them and I loved that touch, but honestly I would have liked more, quick sketches of the situations that Pip found herself in would have worked brilliantly and I think would have added a lot more to the book for the younger reader to enjoy. Its a bit of a short book and theres not a great deal of depth to it but I did really enjoy this book. I really hope there are plans for it to be a part of a much, much larger series as I can see them going quite far with it. I think it would be one of those series where each book can be read sportily too which would be great for its intended age range too. 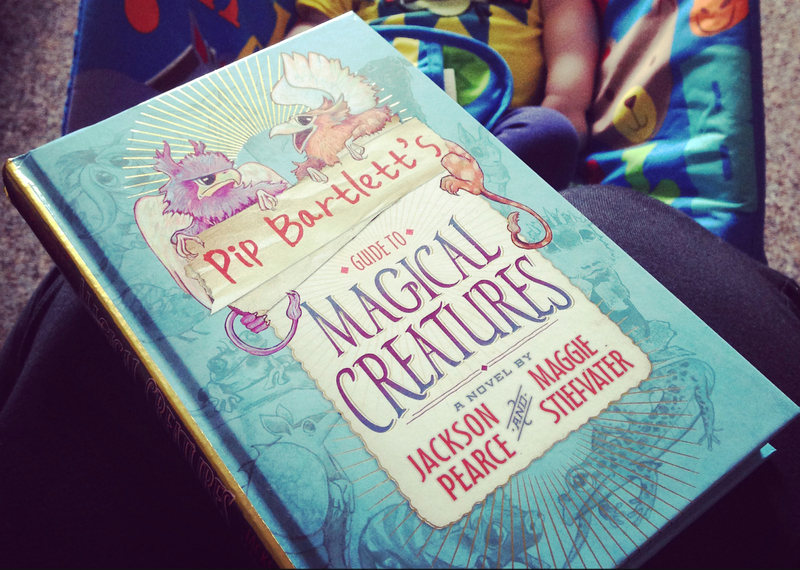 Pip Bartlett’s Guide to Magical Creatures was published in April 2015 by Scholastic. My copy was won in a competition by the publisher on twitter.